Most of us dedicate time to the gym so we can look good outside of it, but that doesn’t mean you have to completely neglect style while you’re on the treadmill. The beauty of finding a workout-proof hairstyle is knowing that you can alter and adjust it to where ever your next destination may be. And the best part is you aren’t relegated to a ponytail or bun. In fact, neither of those looks work for everyone anyway; especially those with shorter strands. So, what are we left with? Ahead, we’ve gathered a handful of pretty, runway-inspired styles that cover the gamut of length and don’t require a ton of prep time. Twist either side of your hair and join both sides into a long ponytail; the perfect transitional 'do between the gym and a night out with friends. If your hair is textured, you're probably already familiar with the life-saving twist-out, which you can wear out or cover with a cute headscarf. A slicked back ponytail is classic and chic for those with long and medium-length hair. Style your long or medium-length hair into cornrows, leaving the ends out. 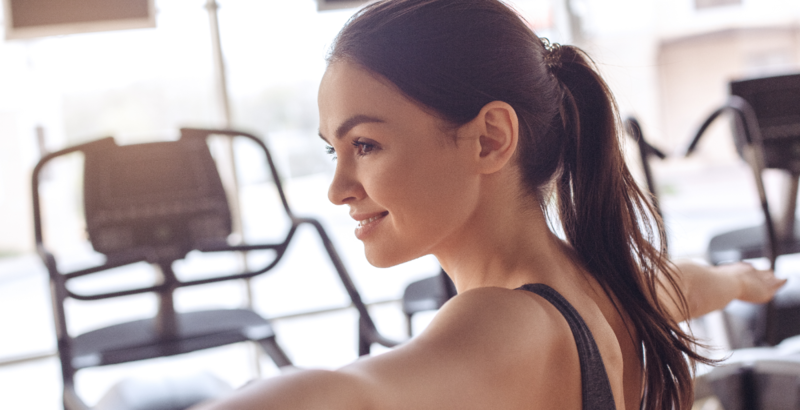 When you're done working out, take them out to reveal wavy strands. If you don't want to ponytail bumps to ruin your perfectly tousled bob, keep strands out of your face with a cloth headband instead. Elongate your bob by styling your hair into loose twists (wet or dry) and removing them after your workout. A messy bun is the obvious choice when you're low on time and have a lot of hair to keep out of your face. Straight back cornrows are a stylish option for every hair length and any type of setting, including the gym. Bantu knots are both stylish and practical, as they protect textured ends and create more body that you can see once they're removed. Cover the length of a long ponytail in fabric to avoid static-y strands. Instead of a messy bun, fold up longer hair and secure it with cute barrettes. Matching fishtail braids may take a little longer to create, but they'll keep your hair from frizzing out of control and save you time in between destinations. These simple braids are a cute and simple option for shorter hair lengths. And voila: the same style is totally doable for longer hair types, too. Those with shorter hair can also style their hair into a simple ponytail and use bobby pins to keep stubborn side hairs in place. A loose fishtail braid is another way to add body to a limp bob. If you're rocking a teeny weeny afro, keep your edges in check by laying them down with a snug headband. This article was written by Nikki Brown from StyleCaster and was legally licensed through the NewsCred publisher network. Please direct all licensing questions to legal@newscred.com.